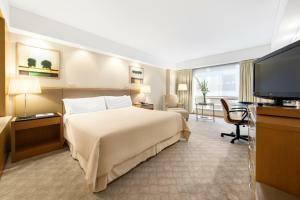 Melia Buenos Aires Hotel offers upscale accommodation 2 blocks from Florida Street and elegant San Martin square. A heated pool, a hot tub, sauna facilities and a fitness centre can be enjoyed. Melia Buenos Aires is nearby Puerto Madero’s restaurant district, Colon Theatre and the exclusive Recoleta neighbourhood. It offers 5-star décor with marble lobby floors and classic furniture. 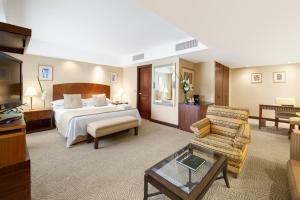 Rooms at Melia Hotel are custom designed to combine elegance with top of the line technology. They feature a thermo-acoustic system, flat screen satellite TV, minibars and coffee makers. There is Wi-Fi access and some rooms have panoramic city views. Stylish dining options with a warm ambiance are offered. Machado Café serves light meals while Azorin Restaurant offers a choice of national and international gourmet dishes. 24-hour room service is provided. 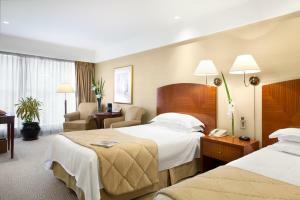 Jorge Newbery Airport is 6 km from the hotel, and there is 24-hour front desk assistance. Car rental is available. Please note the based on local tax laws, all Argentinian citizens and resident foreigners must pay an additional fee (VAT) of 21%. Only foreigners who pay with a foreign credit card, debit card or via bank transfer are exempt from this 21% additional fee (VAT) in accommodation and breakfast when presenting a foreign passport or a foreign ID along with a supporting document handed by the national migrations authority, if applicable. Please note, at check-in, guests must provide the credit card used to make the reservation. Suite featuring a separate seating area and a bathroom with bathtub. 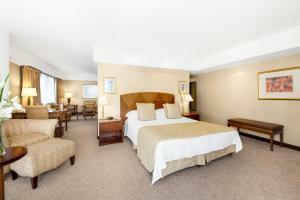 Spacious suite featuring a separate seating and dressing area and a bathroom with bathtub. A comfortable room with contemporary décor, styled in light shades, and featuring high-speed Internet access and a spacious bathroom with a bathtub. 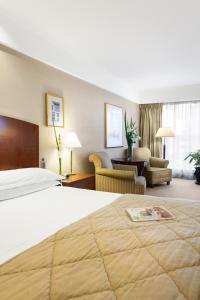 The room includes luxury amenities, late check-out and room service at no extra charge. Features contemporary decor, work desk and private bathroom with shower and bathtub. 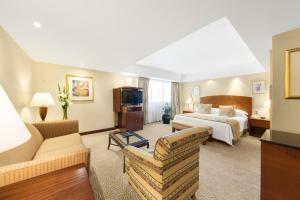 Rate: US$ 139.00 ... US$ 397.00; select dates below to get current rates. Spacious room featuring contemporary decor, work desk, and private bathroom with shower and bathtub.